Syncsort’s Backup Express is a powerful package, but that strength comes at a price. Backing up data can be a tricky process for any computer user. But when you’re in charge of backing up data for a large heterogeneous network, the complexity multiplies quickly. If you’re supporting multiple OSs on a single network and dealing with technologies such as Storage Area Networks (SANs) or tape jukeboxes, your choice of backup solutions is limited. Syncsort’s Backup Express is one attractive contender. 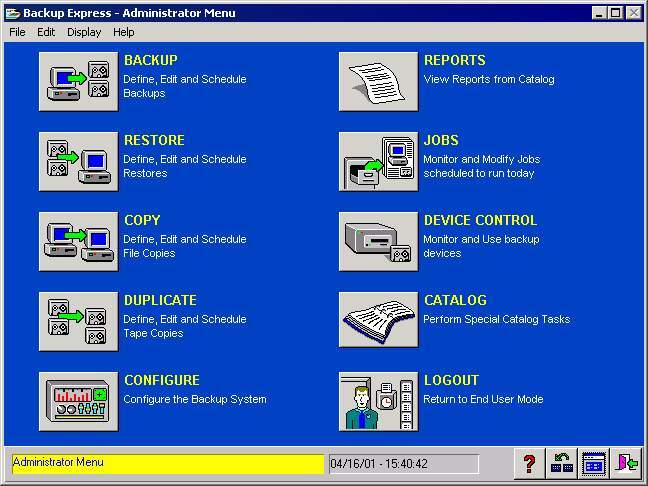 Backup Express is a cross-platform—Windows, Unix (including Solaris), Netware—product that handles all the latest technology you’d expect: SANs, Network Attached Storage, tape jukeboxes, Network Data Management Protocol and more. Syncsort has also kept the software up to date with Windows 2000; you can back up volume mount points, disk quotas and files that have migrated to remote storage, as well as the system state (things like the registry and SysVol that are essential to Win2K functioning). 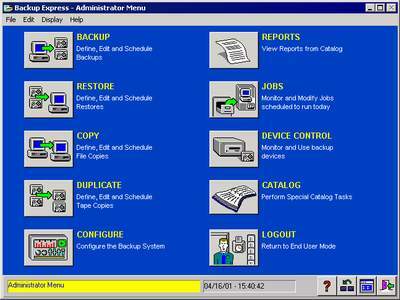 The cross-platform nature of the application is evident in the GUI used for managing Backup Express, which is quite clunky and not very close to the Windows interface standards. You’ll run across strange fonts, windows without close buttons and garish colors. Of course, it’s equally clunky and garish on all supported platforms, which is a plus if you need to move between them. You’ll probably also find Backup Express more difficult to set up than most applications. For example, you’ll need to know the device names (such as \\.\Tape0) of all the backup devices you want the program to use. I haven’t run across any other Windows backup program that won’t figure that out for itself. You’ll also need to enter the capacity of the backup tapes yourself. Even the minimal configuration for checking to make sure everything is working will take you an hour or more to set up. The tradeoff for all these annoyances is raw power. Backup Express can manage everything from a single master server to a set of servers distributed across your network. With the latter arrangement, you can back up sensitive data locally so that it doesn’t have to cross the network. All communication among parts of the application is by TCP/IP, giving you infinite flexibility in architecture and control. Backup Express is also designed to emphasize speed by parallelizing operations, rather than minimizing CPU utilization; this is the proper choice for the large enterprise, which might have hundreds of gigabytes of data to back up and can afford dedicated servers for the task. Backing up data on a complex network isn’t a task to be taken lightly. If you’re responsible for such a task, and you’re outgrowing your current solution (or patchwork of solutions, depending on whether your network was planned or just grew), then you’ll definitely want to look at Backup Express as an option. Pricing varies depending on the size and complexity of your network. You can fill out a form on the Syncsort Web site to request a sample copy of Backup Express on CD as well as further sales information.